Over the years we have found that we learn something new at every Bodega we visit. 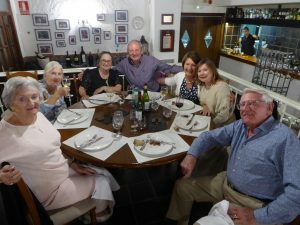 This trip was no exception and so I have included much of that detail and hope that the readers who just want an overview can skip to the sections that interest them. Thanks. 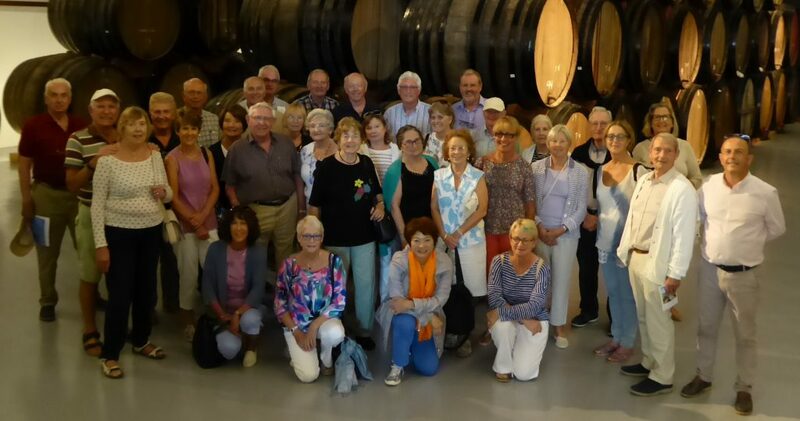 This year’s wine trip is based in the town of Biar in the DO of Alicante which hosts 36 certified bodegas. 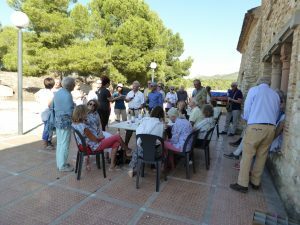 We were based in the town of Biar and visiting bodegas close by and in the town of Pinoso. 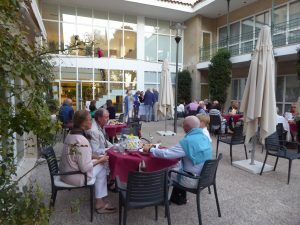 Biar is located located just 39km from Alicante. In addition to wine the economy is based on manufacturing, particularly dolls and pottery. 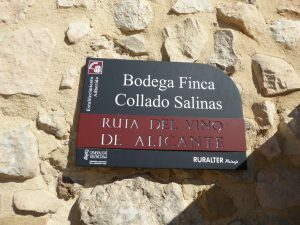 Like many other Spanish regions, Alicante’s winemaking history stretches back over many centuries. By the 15th century, Alicante’s wines were famous throughout Europe. Many wine historians attribute this fame to Fondillón, although most writers of the period referred to wines from this region as “Alicant” rather than “Fondillón.” France’s King Louis XIV is said to have refused all wines except those from Alicante when he was on his deathbed. 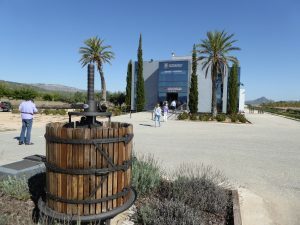 During the 19th and most of the 20th century, Alicante winemakers focused their efforts on producing bulk and table wines. As a result of this the wines did not enjoy a good reputation. 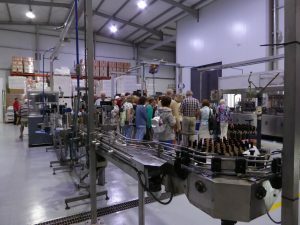 However the arrival of modern winemaking techniques and equipment has brought positive change to this DO which it was hoped would be demonstrated on this short trip. This visit was extremely professional, including a video of the background to the Bodega, a visit to the vines and a tasting supported by PowerPoint slides. 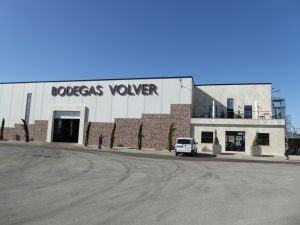 The video explained that the Bodega was the result of 4 generations who still focussed on “Culture, Tradition & Passion” and that some of the vines were now 90 years old. At some 525 meters above seal level, the night & day temperature differential helped create excellent wines, and Monastrell “loves suffering on the rocky, dry & white soil”. 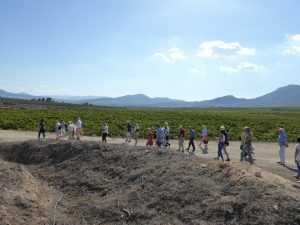 Miguel Angel, the Sommelier, explained that they were now harvesting again, having started in early September but had to stop because of the rain. 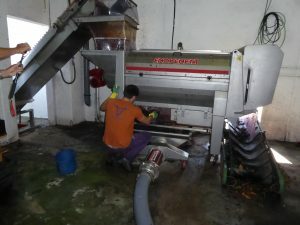 We saw one load of grapes arrive and the machine transferred away the stems (“the animals love them”) and pumped the juice to the vats after a sample was taken and yeast added. Yeast dies at 30°C, and so the juice was kept fermenting for 3 days at 27.2°C before becoming ‘Wild Wine’. They used only French Oak barrels (€750 each v €250 for American Oak) and they didn’t filter their red wines but did filter the white. They keep the barrel room at 80% humidity but still lose 5 – 6% of wine in the process. 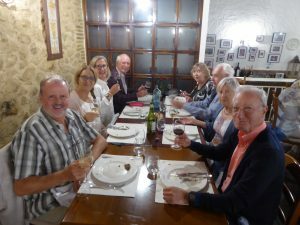 Each person had their own tasting place with 5 glasses, tapas and a sheet of paper to record which wine was in each glass. Tarima Hill (Temperanillo) (€10.00) from their other Bodega in DO Mancha with a taste of tobacco, liquorice and blackcurrant. This small bodega has achieved some good scores from Peñin with its Delit 100% Monastrell scoring 93 points and which we will be tasting. 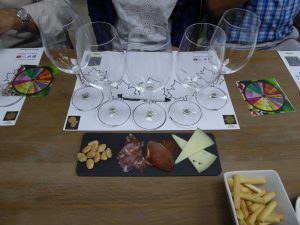 We have experienced in previous wine trips the uniqueness of each bodega and you will find that this one is no exception, producing excellent quality wine in small premises. We met up with Maria Carmen, the Sales Manager who advised that the grapes grew at 600m high above sea level where temperatures can range from 45 – 50°C in the day and drop down to 16 – 18°C at night. The harvest had started the day before we arrived and it seemed to be a family affair including her sons and daughters starting at 06.00 hrs! We were shown the 3 areas where they were growing grapes. A valley area with good soil and poor drainage – excellent for the vines. It is full of rich minerals, millions of years old. This soil is similar to the highly acclaimed region of Priorat. They have Merlot (wins the most awards) here, growing it high on wires so that the wind blows through it and it’s easy to pick. The owner of the Bodega had originally grown grapes to sell for eating but his inexperience meant that they had been overwatered and therefore the roots had not forced themselves far enough down. These may have to be ripped out and new vines planted. That same owner now listens to the local people on what to do. 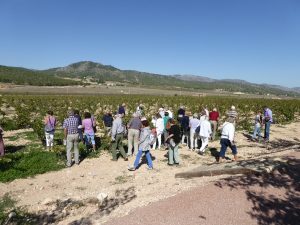 We then walked to a sloping area of much lighter sandy white soil, where they had taken up Cabernet Sauvignon vines and planted (in January 2018) Monastrell and Garnacha. They hope to get wine from these in 3 years but it will take 10 years before they can produce grapes for good quality wine. Monastrell is now the grape that is very much in demand. 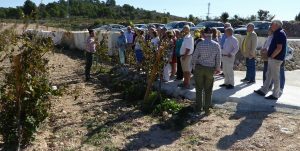 Further away with different soil, they had planted Moscatel & Macabeo, with some Chardonnay. They were also looking to buy grapes from other parcels of land if the quality was right. 45% Chardonnay with 55% Moscatel – their wine that wins most prizes. Merlot 85% and Monastrell 15%. Lively and bright colour. On the nose, the ripe strawberry with notes of jam predominates without being excessively intense. Syrah 85% and Monastrell 15%. Very attractive colour of great intensity, with violet hues that remain over time. On the nose, this direct Syrah shows mostly a ripe fruit with a slight touch of unroasted coffee. Merlot 100% (free-run juice) i.e. Not pressed but fermented totally in the skins, which are moved around during the process. The wine is then separated off for 1 year in the barrel with the residue going into a less quality 2nd wine. Cherry hues and the nose is extremely intense, predominantly fine pastry and blackcurrant aromas, with a slight spicy touch. Made from 100% Monastrell 70 year-old vines with 12 months in 300 litre barrels & 5-6 years in the cellar. Only 4500 bottles per year and normally only sold to Michelin Star restaurants. DELIT Spanish word for DELIGHT. Pleasure of the soul and the senses. After a trip to a Ceramics factory with a video presentation, we drove to the bodega, part of the MGWines Group which has some innovative concepts that demonstrates how the local Alicante wines have progressed to achieve international recognition We were hosted by family member Rafael Poveda who took us to the vineyard and then explained that also have 250 hectares of old olives producing 500,000 bottles a year. They produce 1.5 million bottles of wine a year but Fondillòn is at the heart of the Bodega. The harvest was due to start next week with Monastrell being their ‘Queen of Grapes’ – the camel of grapes as it survives only with moisture from the morning dew. 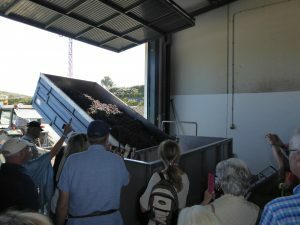 It has a long harvesting ‘window’ so they can choose to pick to suit the wine they want – sometimes in September, older vines mid/end October but young wines on 1st day of November. As a comparison, Merlot has a 1-week harvesting ‘window’ They need to prune every January or the vine will ‘overgrow’ and die. They also give the tall vines a ‘haircut’ in June to cut them back from 2m to 1 – 1.5m. They still have some of his Great Grandfather’s vines at over 100 years old. Rafael obviously had a thirst for knowledge about wine as he explained that they harvest by hand for quality although recognise that a machine picks at the rate of 250 people. In the South of England they grow vines on fences to get the sun but in Alicante they grow in bushes to try to give them some shade. In China, where temperatures can get down to -20°C, they cover the vines in soil to protect them and then uncover them for summer growing. They now subcontract the picking & pruning to (Spanish) companies who provide the labour and charge per kilo picked. As these pickers are experts, 20 people can pick 1 hectare in 1 hour. This relieves the Bodega of labour & accommodation responsibility and is better than the 1960’s when they employed gypsies, the 70’s were North Africans, the 80’s people came from Ecuador & Bolivia whilst the 90’s attracted Polish & Romanian pickers. Rafael explained that they only pick the grapes towards to bottom of the vines as the top ones are dry, acidic and called ‘Cabroda’ = goat droppings. They allow the local goat shepherd to bring his animals in to clear these, with the ‘payment’ of a baby goat at Christmas. Whilst the roses attract insects and are a good barometer of the state of the vines, Rafael explained that the best pesticide is the sun in June, July & August as it kills off all the bugs. Rafael explained the evolution from natural cork, through composite, synthetic and screw cap. They sell to Sainsbury’s, & Tesco’s largely in screw cap as cork costs 10x more. However, they sell to (UK) restaurants with corks because of customer expectations and the ambience it creates. They also sell to Harrods. They produce their own labels at the time of bottling (can fill at 1 bottle per second!) to allow flexibility. All Bodegas pay a ‘glass tax’ that funds all the green glass recycling bins we see in the street. This enables new bottles to be produced in an environmentally friendly way. 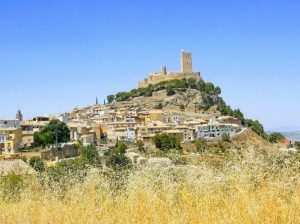 Alicante wines are now attracting attention from wine critics around the world. Alicante winemakers have also rediscovered Fondillón and are working to bring this unusual wine back onto the international wine scene. Not everyone has heard of Fondillon but it is one of only five wines recognized by the European Union as unique “luxury” wines. What is Fondillon? It is usually marketed as a dessert wine but some versions are dry, while others are sweeter, depending on the grapes used. Fondillón is made from extra-ripe monastrell grapes that are allowed to remain on the vine longer than usual. The grapes are pressed, fermented with their skins for a short time, then aged for at least eight years in oak. Many Fondillóns are aged in soleras (approx. 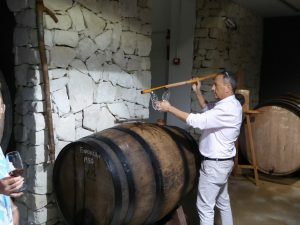 1155 litres) , using production methods similar to those used to make sherry. The result is a dark red or amber-coloured wine with a high alcohol content, either dry or somewhat sweet. For many years it was thought that the techniques for making quality Fondillón had been lost to history. Fortunately, in the 1940’s one Alicante winemaker, Salvador Poveda Luz, decided to re-establish Fondillón.. He bought up many old barrels and ordered some more to be made by specialist coopers in Alicante. Many of the barrels in use are 150 – 200 years old. It is one of 8 Cellars in Alicante (and therefore the world) that is authorised to make Fondillòn. 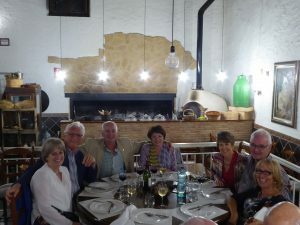 We were fortunate enough to taste (in the “Sacristy” of this bodega) his special Fondillòn. poured from a barrel that had been started in 1950. Each year they add about 10% of the following year’s production so it blends – “so it won’t punish the mother”. The taste was like a red desert wine and similar to Port, Sherry and Madeira. It is all natural, not fortified and all Monastrell at 16.5% alcohol. Each cork is smelt by Rafael or his cousin to make sure it is good as the Fondillòn is expensive and should not suffer from a ‘bad cork’. Each bottle is supplied with a glass stopper as it can be tasted and then left sealed for months, if not years. 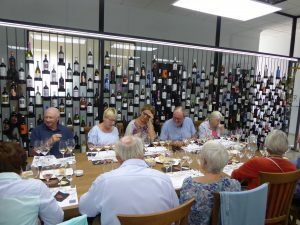 We were due to taste 4 wines but the Bodega were receptive to requests to open other specific bottles and so we ended up with 7 wines available! Pale and bright white. The fragrance is white flowers, laurel and green apple. It has a dry flavour, fruity, light and subtle. Pale yellow colour, clean and bright. A fruity bouquet highlighted by citrus and tropical fruit notes, with a background of white flowers. The initial attack on palate is fresh and silky, showcasing balance with a lingering aftertaste of delicate tropical fruits. Red purple with intense and bright blues hues, clean and fragrance it mixed with vanilla, fruit and strawberries. Elegant and fresh, slightly floral with notes of red berries. Light and fresh on the palate, with great acidity & balance. Deep cherry red & bright. Intense aromas of ripe blackberries with a very subtle balsamic background. The palate is fresh, fruity, with mineral notes and a slightly spicy touch. Good balance and structure. Intense red colour, with purple rim and medium depth. Aromas of fresh red fruits, with hints of spices and reminiscent of bakery. Soft mouthfeel, notes of juicy red fruit, a good structure and a long tannin finish with balanced and pleasant acidity. 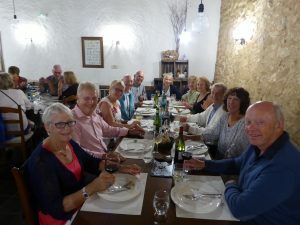 Lunch as due to be at the Bodega but it was rearranged to a local restaurant with lots of rustic atmosphere and Bodega Monovar wine before our bus journey home when President Paul Nicholls thanked Sandy & Tim Fawle + Shirley & John Sloggie for all their work to create a great wine trip and to also ‘present’ them with a customary gift from the attendees of a few bottles of wine.